Interview in LHV News: Egypt's future - Chile, Haiti or Indonesia? LHVnews: Morsi’s removal by army has angered his supporters and created deep division in the country. Hundreds have been killed and thousands have been injured in recent weeks, either in clashes between opposing protesters or in clashes between protesters and Egyptian army. How did Egypt get to this point? Why was Morsi removed? Who’s protesting, and why? Walberg: The 25 January 2011 revolution, a spontaneous revulsion by both devout Muslims and young secularists with Egypt’s version of western-imposed modernity, resulted in the collapse of the seemingly impregnable Mubarakite order in 2011. The uprising resulted in a benign ‘modern’ coup, with grim generals on TV and soldiers in tanks, pushing the geriatric corrupt president out. This finally opened the road for Egypt to seek its destiny as a devout Islamic society, as confirmed the next year when Islamists, led by the Muslim Brotherhood (MB) and its Freedom and Justice Party, gained 2/3 of the seats in the most democratic elections in recent history—anywhere. But Morsi surprised everyone. He attempted to assert control over the military, forced Israel to put on hold another slaughter in Gaza, refused to bow to IMF pressure on food subsidies (instead mobilizing MBers to end corruption in the delivery of bread), rejected intense pressure to join Turkey and the West in invading Syria, made overtures to Iran on normalizing relations and finding a peaceful solution to the Syrian civil war, forged ahead with the Shura Council as the last legitimate elected body left by the Mubarakite judiciary and military, whose broad-based Constitutional Constituent Assembly wrote a fine constitution, incorporating much sharia. Looking back, the Muslim Brotherhood can take pride in its accomplishments in the face of open treason by the secular establishment and the pro-Saudi Salafis, who broke ranks in a foolish political move that will damage them long into the future. The Mubarakites, with control over the economy, were able to instigate shortages by suppliers, strikes by workers, and inundate the airwaves with disinformation belittling the MB. Founded two months before the coup, the opposition Tamarod (rebellion) claims to have got 22,134,460 signatures and attracted 30m demonstrators on 30 June, wildly exaggerated claims blindly repeated by the Mubarkite and western media. LHVnews: Where does it go from here? Walberg: This counterrevolutionary euphoria is floating on deep waters, which are impossible to quell or drain. Even western analysts such as Geneive Abdo admitted in the waning years of Mubarak’s western-backed, secular dictatorship that "historical, social and economic conditions had laid the groundwork for society’s return to religion.” This culminated in the 2011 uprisings, soft-pedaled by western media as the ‘Arab Spring’, but which is in fact overwhelmingly inspired by Islam, and harks directly to Iran’s 1979 revolution, Algeria’s 1990 revolution, and the Palestinian Intifadas (1987, 2000), where liberals and secularists played no part. In 1979, on the cusp of the Iranian revolution, a young Egyptian MBer, Essam el-Erian (now Freedom and Justice Party vice-chairman and MP) said, "Young people believe Islam is the solution to the ills in society after the failure of western democracy, socialism and communism to address the political and socio-economic difficulties.” Three decades later, the Muslim Brotherhood is riding a wave of youthful idealism and reaping the rewards of its 84 years of experience both in organization and as the persecuted shadow of Egypt’s march towards modernity, though, as the coup confirmed, it is faced by powerful enemies who reject the new ‘map’ being proposed for society. Hopes that Egypt would consolidate a new form of Islamic democracy have for the moment been crushed. So far, the only Islamic revolution to succeed is the Iranian one, still going strong, though suffering from western intrigue, including the war with Iraq, economic crisis, subversion and sanctions. Other Islamic revolutions—in Algeria and Afghanistan—were aborted under western pressure. Turkey’s transformation beginning in 2001 with the sweep by Islamists at the polls, but like Egypt’s Islamist triumph, has been deeply compromised by a powerful secular military and close integration with empire. LHVnews: Where does the United States stand? What do you think about the presence of two US leading senators, McCain and Graham, in Cairo? Walberg: This is a fateful moment. The US could join the EU and refuse to negotiate with the illegitimate new regime, and demand that Morsi be reinstated. President Clinton did this with Haiti after the coup against President Jean-Bertrand Aristide in 1991. The coup regime collapsed in 1994 under US pressure and threat of force, and Aristide was reinstated for the final year of his term. But this is unlikely, given the strategic importance of the Suez Canal and the close relations between Egypt’s coup leaders and the US military. Instead, Egypt faces a nightmare return to the 1980s-1990s, when the Brotherhood was underground, and terrorist acts were committed by desperate, alienated Islamists. LHVnews: A lot of people are saying the fact that Morsi was trying to push the military out of politics in Egypt, the fact that it was for instance trying to have better ties with Iran, that it was not going ahead with intervention in Syria alongside Turkey, these are some of the points they said that made the US want Morsi to be out of power. What do you think? Walberg: Morsi indeed wanted to end the hypocrisy of Egypt being Israel’s ally and Egypt’s military being trained and equipped by the US, an absurd situation, given US devotion to Egypt’s only enemy, Israel. Morsi also started to repair relations with Iran, but this foreign policy was a threat to the military leaders, whose careers have been built on collusion with the US and Israel against Palestine and Iran. As the pressure on Morsi increased from the military and the secularists, the pro-Saudi Salafi demanded that Egypt support the rebels in Syria, and as the MB became desperate in the face of open treason by secularists, Morsi agreed to Salafi demands, a sad conclusion to an otherwise admirable record in office. LHVnews: The US and even the EU have been quite clear about one thing at least when it comes to Egypt and that has been a clear call for Mohammad Morsi to be released. They have been asking for that. Why do you think they have made that very much clear about their stance? Do you think that the talks that are now taking place, the diplomatic efforts are about forcing the military to release Morsi or to get him out of this situation with impunity or out of the way of prosecution? What might the future hold? Walberg: The scenario of the 1973 US-funded coup in Chile was repeated in Egypt, right down to gasoline shortages and disruption of transportation. The Saudi princes withheld promised financial aid to the MB, clearly with the blessing of Washington, and welcomed Egypt’s Pinochet with open arms, as he carried out the classic ‘modern’ coup with lots of bullets and tanks. The only difference with Chile is that Allende died with a rifle in his hands, defending the cause of the people. Egypt’s Morsi was arrested and spirited away, though at least 150 unarmed MBers have already been murdered, many by army snippers, captured on video. The US realizes that this is a new political era, that such open brutality by the military is no longer acceptable internationally. 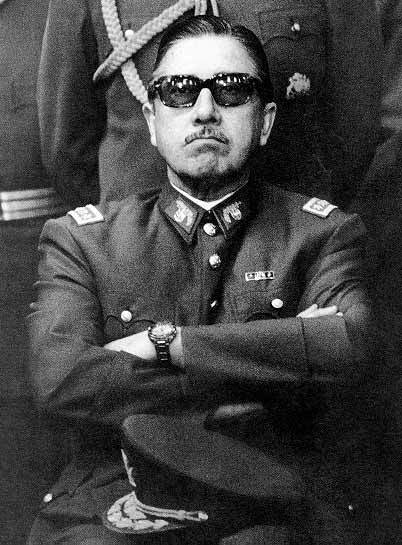 Since the 1980s, bald coups in the tradition of Chile’s Pinochet have been frowned upon. The New World Order demands a patina of democracy; hence, Haiti, and now Egypt’s postmodern coup, as described above. One postmodern coup that ‘worked’ for the US (at least so far) was in Indonesia, following the collapse of General Suharto’s dictatorship in 1998. The Islamist Abdurrahman Wahid was handed formal power in the post-Suharto chaos, but by 2004, with the powerful military unreformed and no bringing-to-account of Suharto’s cronies, the weary people despaired and voted in law-and-order candidate (and Suharto protégé) General Yudhoyono, who still governs Indonesia today and is a favorite in Washington. The US wants to follow this tradition (also similar to Haiti as described above). 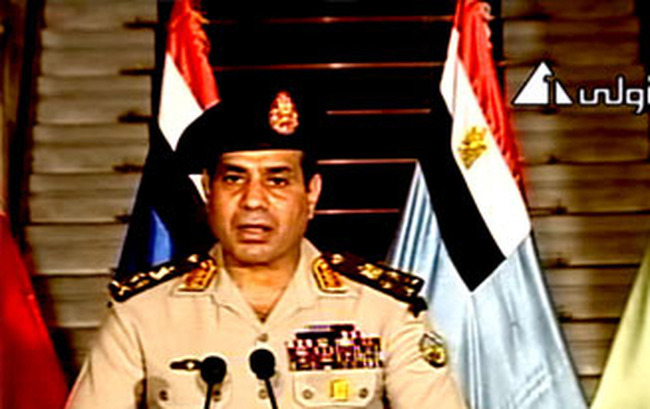 Sisi is not so sophisticated. He would be happy to be Egypt’s version of Yudhoyono, but he looks as if he’s ready to be another Pinochet, and murder hundreds and push the MB underground if necessary. The logic here, whether Pinochet or Yudhoyono, is to appeal to Egyptians’ weariness and desire for security—in Sisi’s case, flavored with Salafist Islamo-correctness. Already mainstream media tout him as "Egypt’s most popular man”, and (surprise!) there is talk of him running for president. Just how successful Obama will be in keeping his attack dog Sisi from perpetrating a massacre is hard to judge at this point. That is why Obama sent two of the most anti-Muslim senators, John McCain and Lindsey Graham, to Cairo this week to pressure Sisi into backing down and enticing the MB to end its demonstrations and accept an interim government role. But the MB rightly demands the reinstatement of the legitimate president. Empty promises of powerless ‘cabinet posts’ and fair elections at some future date are worthless. Sisi will probably muddle through by killing and imprisoning thousands and pushing for his own election as president. The future of Egypt looks grim.